488 pages | 26 B/W Illus. Currently, there are a limited amount of guidelines to help clinicians manage patients with obesity and comorbid mental disorders. This expertly written source fills the gap in the literature by providing a clear overview of obesity and its relationship to mental illness while reviewing the most recent methods to manage and control the condition with diet, exercise, psychological treatments, pharmacotherapy, and surgery. "…this book is absolutely vital to the mindset of the medical professional, since this material seeks to draw tangible links between obesity and various mental breakdowns….required reading for all student-doctors." "…Unlike any book I have reviewed regarding its focus and intent, this text thankfully sheds some light on the topic of obesity to provide clinicians with evidence-based information in helping patients make informed decisions about their care." Obesity is a Major Health Problem: Causes and Natural History. Obesity and Psychotic Disorders. Obesity and Mood Disorders. Eating Disorders in Obesity. Obesity and Substance Use Disorders. Obesity and Smoking. Obesity and Impulsive/Compulsive Mental Disorders. Metabolic Syndrome. Obesity, Polycystic Ovary Syndrome, and Mood Disorders. Dietary Therapy of Obesity. 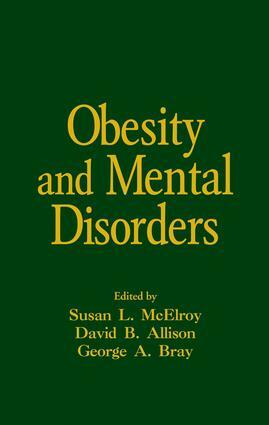 Behavioral Treatments of Obesity With Mental Disorders. Pharmacologic Agents. Overview of Agents with Efficacy in Binge Eating. Psychotropic-Induced Weight Gain and Its Treatment. Medical Management of Uncomplicated Obesity. Medical Management of Obesity with Mood Disorder. Medical Management of Obesity with Binge Eating. Weight Loss Surgery for the Treatment of Morbid Obesity. The Role of Bariatric Surgery in the Obese Patient with Psychopathology.